The Green Party of Northern Ireland have a difficult political environmental to deal with. Decades of often violent sectarian division within this province of the United Kingdom, mean that parties not aligned with the two communities often find it difficult to break through and make an electoral impact. This was true of the NI Greens, but recent elections have seen them grow considerably in strength and make a major breakthrough in provincial elections this year. Part of the reason for the success, apart from hard work and great candidates, was the adoption of the “Green New Deal” in their elections. The Green New Deal is an ambitious policy agenda adopted by the wider European Green movement in response to the financial crisis that began in 2008. Used by many Green across Europe in the European elections in 2009, its core belief is that it is possible to solve our environmental, social and economic problems by a concerted shift to a more sustainable and socially-just economy. The Northern Ireland Greens can be seen very much as a “best practice” for how they adopted the Green New Deal and how it paid dividends in their campaigns. They fought three campaigns in three years (European, Westminster and Provincial in 2009, 2010 and 2011). In 2009, the GND formed the core of their campaign for the European Parliament elections. The result was a trebling of their vote compared to 2004. The GND was used again in Westminster elections in 2010 and provincial and local elections in 2011. The last of these elections was considered to be their most important breakthrough, as they elected their first member of the Northern Ireland Parliament as a “Green” candidate. Prior to that their only other provincial MP had been a long time independent councillor, and so the perception was that he was elected based more on his local record than any voter commitment to Green ideals. In this article, we interview some of the key people involved in the Northern Ireland Green campaigns and suggest how other Green parties can successfully integrate the GND into their campaigns. In particular, we look at how other Green parties on a limited campaign budget can achieve this. As Adam McGibbon, a former candidate, argues, the GND is a simple but effective message that is easy to communicate to voters. The slogan for the 2011 provincial elections was “Good for people, good for the economy, good for the environment”, which effectively communicated what the GND was all about. “It evokes the central, holistic aim of Green politics in plain language without losing the message in translation into the oft-technical of sustainable development” says McGibbon. For McGibbon, it was the ability of the GND to move the perception of the Greens beyond being “just” an environmental movement was crucial. It demonstrated that the Greens were also concerned about more everyday issues such as jobs and taxation, which is a crucial development especially for smaller, less established Green parties. However, even the best message can be useless in a campaign unless it is used in a coordinated manor across the campaign. As Clare Bailey, a candidate in 2011 indicated, all candidates got behind the strategy of talking about the GND. It was used in literature, interviews and on the doorsteps. Tying into the overall European Green Party’s campaign also proved an effective means of running a low-budget campaign. A great example of this is the election video used by the Northern Ireland Greens in 2009, which was the EGP’s video edited to include their candidate for the European Parliament. As well as tying it into the European campaign, it is also important to localise what a Green New Deal would mean for the voters’ local community or city. For Adam McGibbon, this proved to be an easy task. His South Belfast Westminster constituency is located a stones throw from the Harland & Wolff shipyards. Known in a previous era as the home of the ill-fated Titanic, the shipyard now has a new lease of life building wind turbines and tidal turbines. The iconic H & W cranes which dominate Belfast’s skyline are now a recognisable example of what a “Green New Deal” for all of Northern Ireland’s economy would be like. For a small Green party, it can be hard to raise an issue or a policy all by themselves. It was therefore a crucial part of the NI Green’s success that there were other actors in Northern Ireland who were pushing the Green New Deal. Friends of the Earth were early supporters of the idea, but so were businesses, farming groups and Union leaders. They released their own versions of the Green New Deal (in most cases referred to explicitly as a Green New Deal), which gave it added credibility and recognition in the political environment of the province. Other Green parties can replicate this success across Europe by engaging with key actors. Sending these groups copies of various Green New Deal publications from the European Green movement or organising seminars and discussions with them can be effective means of creating new alliances in arguing for a transformation to a sustainable economy. What to do about other parties? While other organisations adopting the GND model is always a positive development, it can be a little trickier when other parties do so. As it may be some time (though hopefully not too long!) before Green parties are in the majority across Europe, it is essential that other parties come around to the Green way of thinking on the need to rapidly transition to a sustainable economy. The Northern Ireland Greens therefore adopted a two-pronged approached. Parties that didn’t support the idea of a Green New Deal were publicly criticised for failing to recognise the essential requirement of switching to a low-carbon sustainable economy. This had some high profile success, for example when one of the larger centre-left parties came out in support of the GND after being publicly criticised by a Green candidate. When parties did adopt the idea of a Green New Deal (as many did by the 2011 elections), the NI Greens welcomed it but argued that the Green Party were the only ones with a full understanding of the change required, whereas other parties were just cherry picking the easier aspects of the plan without fully understanding the full change that is required. While the GND is an effective message at election time, it is something that Green parties should campaign on between elections so as to raise awareness of the idea and attract new members and supporters to the Party. Northern Ireland Green Councillor Cadogan Enright updates his website regularly with news on the Green New Deal, especially on the steps that are needed to develop renewable energy in his local area. There are lots of ways that even small Green parties can use the Green New Deal in their campaigns. Petitions in support of renewable energy, public meetings etc all provide low cost ways of raising the Green New Deal. There are some dangers and pitfalls that need to be avoided by parties wanting to adopt the Green New Deal concept. The first may be cultural difference specific to the country. For example, in the Czech Republic the concept of a “New Deal” is less positive and has connotations of Communist-era big Government. Instead, they use the term “low-carbon economy”. The second is that party candidates and activists must be training so that they can defend the idea of a “Green New Deal”, which has its detractors. 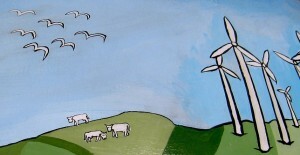 Criticisms can range from it being too expensive, to it damaging the environment through the construction of wind farms. These criticisms may be easy to refute, but it is important that the party speaks with one voice on some of these issues. However, a well thought-out use of the Green New Deal can give your Green campaign that crucial boost in credibility and innovation that can be essential for smaller, less established parties. Have you used the GND in your campaigns? Please let us know in the comments section below.